We are Michael Smy Funeral Directors on the junction of Bramford Road and Sproughton Road in Ipswich. 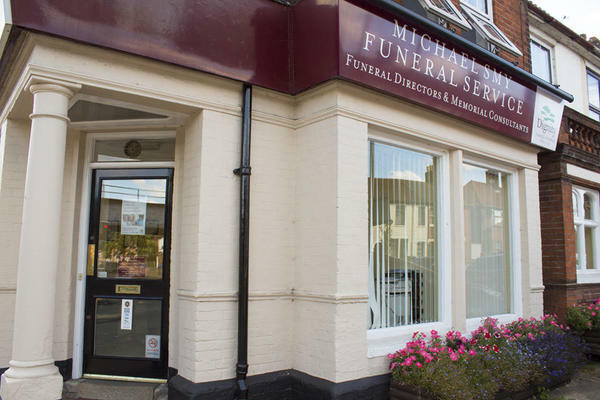 Established in 1975 by Michael Smy and his wife, this is our second funeral home, enabling us to help our local families in Westbourne, Whitton, Castle Hill, Chantry and others better. We understand that losing a loved one is never easy. You can trust us to take care of all the arrangements on your behalf, so that you can take care of yourself and your family in peace. Whatever you may prefer a humaist funeral, religious funeral or contemporary funeral like woodland burial or burial at sea, we can arrange it for you. We have over 40 years of experience and knowledge of the local area, which means that you have unlimited choices and options. We will take care of all the details, small or big, so that you can say farewell to your loved one the way you want to, with dignity and care. We also have a chapel of rest, should you wish to spend time with your loved one before the day of the funeral. We are available 24 hours a day for you. So call us anytime, whether it is for advice, help or just someone to talk you. We are here for you. Call us today on 01473 747422 to talk through your personal requirements. There is parking available at the our funeral home. We are on the corner of the junction of Bramford Road and Sproughton Road. Our staff are available 24 hours a day on 01473 747422 if you require our services outside of these hours. Fantastic service from Ben and the team. Extremely professional, efficient and empathetic at a difficult time. They made a difficult day a little easier. My family thanks them for their efforts, it was greatly appreciated. Thank you for the comments left as part of your online review. I am pleased that we were able to look after you and your family at this difficult time. All the family were extremely pleased with the whole service from walking the hearse in to viewing of the flowers. From my point of view the arranging of funeral was made so easy for me particularly as I was abroad at the time. Thank you for all your help and we will definitely recommend your services to others . Family views were of utmost importance in the planning of our dads funeral. Ben listened, offered advice and suggestions, and accommodated all of our wishes. This made the day a true celebration of our dads life. I have used them twice for both parents who had a prepaid funeral plan. They made the process very smooth and assisted us through each stage of the arrangements. Even Michael Smy himself came out of retirement to officiate things. I used the Bramford Road branch as it was nearer to home and felt like I got a personalised service. Would highly recommend.